This article is about the town in Iraq. For the West Bank town, see al-Auja, Jericho. For the past Palestinian village, see Auja al-Hafir. For the river, see Yarkon River. 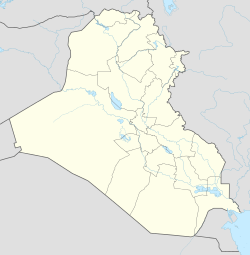 Al-Awja (Arabic: العوجا‎; also known as Owja, Al-Auja or Al-Ouja) is a village 8 miles (13 km) south of Tikrit, in Iraq on the western bank of the Tigris. It was the birthplace of the former Iraqi President Saddam Hussein in 1937 and home of many of the leaders of Iraqi provinces during his Presidency over Iraq. When Saddam was found by the 4th Infantry Division, he was hiding only a few miles from his hometown in the town of Ad-Dawr. Saddam Hussein was buried in this village before dawn on December 31, 2006, less than 24 hours after his execution took place. During the fighting in the Second Battle of Tikrit, Saddam Hussein's tomb was levelled by ISIL. After Iraqi forces took the control of the village, Shia militiamen of the Popular Mobilization Committee put Shia militia's insignia around the village, including that of Maj. Gen. Qassem Soleimani.